What opera CD/DVD have you purchased recently? Thread: What opera CD/DVD have you purchased recently? 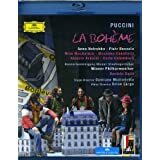 I purchased LaBoheme but have not received it in the mail. I don't think Anna is the one who is playing Mimi. I think it was Teresa Straus. Darn! I wish I had found this place earlier. BTW, thanks for the tips on who to look for. Everyone you recommended looks good to me. I'm sure their singing is equally as charming. Time to do a bit more planning. If it's the one with Teresa Stratas & José Carreras, I've got that one & I love it. Carreras is fabulous. Use our guides as that, just guides. Sometimes it's best to just jump in & find stuff you like. It doesn't matter what other people think or say is the 'best' singer, 'best' opera etc - go by your ear & your heart. 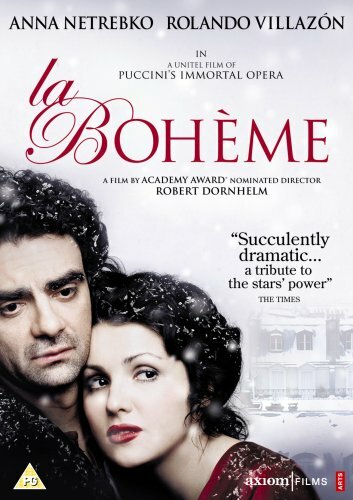 I may also pick up Netrebko's DVD of La Boheme as well. I see that DVD was rated #1 here, so it may give me a good chance to see different versions of the same opera. Plus, I now am very motivated to view Anna to see if her voice matches her countenance. Not trying to dismiss Stratus, but Anna "looks" pretty special. She is awesome . I'm going to see her in Eugene Onegin at the Met in Lincoln Center on October 19th. Teensy-weensy problem staying in tune, but her "countenance" makes up for that! By the way, this is not a traditional opera video as there is no "stage" per se in the Netrebko La bohème. This is absolutely wonderful. Young principles. Great singing and conducting AND acting! Couldn't see it being done better. Thanks for the heads up regarding the "no stage" opera. Don't know how I feel about that. I may go to YouTube to see if I can find a song or two from that DVD to check it out. Obviously this wouldn't hurt the singing, but admittedly, the video side is very important for me too. Time to do more research. Thanks again. What I mean by no stage is that the one where Anna stars opposite Rolando is an opera "movie". I recommend this to friends as a gentle introduction to opera (that is, segueing from movies). oh, I thought you were referencing this one. I guess not. Yes, I see there was also a movie she was in. Okayyyyyyyyyy. I read some reviews on this one and noticed many were not happy with this "modern" interpretation of the story. I actually thought that was what you meant by "no stage." Yes, that's why I mentioned Rudolfo in particular. Definitely did not mean the Salzburger production. Bizet's Carmen - Conducted by Sir Thomas Beecham featuring Victoria de Los Angeles in the titular role. I loved Victoria de Los Angeles from the first recording I heard from her on YouTube and subsequently picked her EMI Icons set. I am also a huge fan of Sir Thomas Beecham, yet I was still surprised by just how superb the excerpts from Carmen were - hence I bought the full opera. Parsifal - My exploration of Wagner continues with me jumping the gun and picking up Parsifal on both CD and Blu-Ray. - The CD is by Gergiev/Mariinsky Orchestra - I have read a lot of good things about this recording, so I decided to take a chance on this rather than Thielemans set. The Gergiev seemed to come out slightly ahead from what I have read. I almost erred towards the Barenboim but my heart was already set on the Gergiev so I went with my gut. - The Blu-Ray is the Nagano/Lenhoff production as suggested in the sticky thread up top. Again, the Barenboim was tempting and both were equal in reviews I had read - both with pro's and con's (such as a couple of plot alterations in the Nagano I believe) but in the end this one just grabbed me. I may go back to the Barenboim later, I'll have to see. Lohengrin - I have had the CD for a bit as conducted by Rudolf Kempe so I decided to pick up a DVD as Opera is far more enjoyable with the visual element - plus I find the CD's easier to follow when I can visualise it better in my mind. I again went for the Nagano/Lenhoff production. Le Nozze Di Figaro - The new Glyndebourne release of the Ticciati/Grandage production. I know it is more modern production as opposed to a period setting but it looks interesting and reviewed well. Furtwangler Scala Siegfried and Gotterdammerung to complete that series. The Bohm Meistersinger live from Bayreuth. I finally have my own copy of the Robert Lepage MET Ring! Hojotoho! Well, you can't have too many recordings of your favorite operas. Just bit the HUGE bullet and ordered the Keilberth stereo Ring. Very excited to get it. Big Wagner month for me. All times are GMT +1. The current date and time is Apr-25-2019 11:19.